I got books for my birthday last week! What books came into your house? 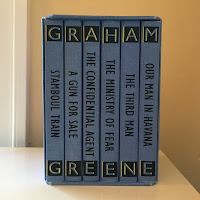 I spotted this nifty boxed set of Graham Greene novels at Powell's Books a couple of months ago and Hubby remembered it for my birthday. Sweet guy!